Andculture, a Pennsylvania experience design firm, launches secure platform to improve patient and physician engagement during the surgical process with CloudMine. 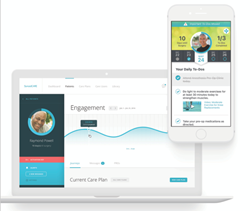 Andculture, a research and experience design firm, recently developed and launched SyncedCare, a first-of-its-kind healthcare platform that improves patient and physician engagement before, during and after surgical procedures. SyncedCare is a HIPAA compliant mobile application that connects patients, physicians, and care teams. The platform facilitates timely, two-way communication with a patient’s medical team and provides them with information to help them plan appropriately with family and caregivers. Doctors and medical care teams benefit from improved ability to track protocol compliance and from streamlined communications with patients. Hospitals benefit from reduced cost of cancelled surgeries and from improved performance on readmission rate targets. Andculture worked with CloudMine, a backend-as-a-service provider that hosts HIPAA compliant data, to help deliver the SyncedCare product. The accessibility, scalability and focus of CloudMine’s technology make the company an ideal long-term partner for Andculture. “As we continue to work with healthcare institutions, having a proven partner that we can trust—especially one that is focused on healthcare innovation—is invaluable,” added Hickethier. CloudMine holds the patient information used in the SyncedCare platform, including detailed care plans; messages exchanged between patients, physicians and care teams; and other sensitive information. Andculture is able to access this information through an API that taps into CloudMine’s back-end technology. This allows patient data to be shared back and forth securely within SyncedCare without compromising the overall design and user experience of the app. The partnership between Andculture and CloudMine is a testament to the growing tech scene in Central PA. To learn more about Andculture and SyncedCare, read the case study or visit Andculture.com. About CloudMine. CloudMine is the leading HIPAA-compliant Enterprise Health Cloud platform. CloudMine empowers healthcare organizations to rapidly and confidently develop connected digital health experiences by reducing complexity, enabling data mobility, and ensuring compliance. Recognized by industry analysts for their vision, collaboration, and ability to scale, CloudMine is partnering with a diverse portfolio of customers, such as the American Heart Association and Thomas Jefferson University Hospitals, to successfully address many of the biggest challenges in the digital transformation of healthcare. For patients, providers, clinical investigators and digital innovators, connected healthcare is better healthcare. For more information, visit http://www.cloudmineinc.com, call (855) 662-7722, or follow @cloudmineinc on Twitter.